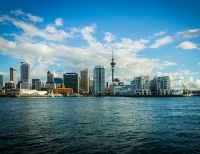 Auckland is situated on a narrow strip of land, flanked by two magnificent harbours to the east and west. The shallow Manukau Harbour opens out to the Tasman Sea to the west, while the Waitemata Harbour lies at the heart of the city centre and is Auckland's deepwater port. It has a vibrant waterfront that has flourished with the successful hosting of the America's Cup, and the trendy restaurants and waterside cafes are a constant hive of activity. Known as the 'City of Sails', with a larger boat-to-person ratio than anywhere else on earth, it is a paradise for sailing enthusiasts. Every weekend the waters of the Hauraki Gulf come alive with a flotilla of colourful sails. The best way to experience the city is from the water, sailing around the attractive harbour or on a ferry cruise to one of the many stunning islands dotted about the Gulf.